Each of the threat reports comes with a nice piece of color art of the character embedded in the PDF and a separate Hero Lab file. Each includes a prop cover letter from AEGIS, possibly useful for setting a scene, that gives a basic idea about what is publicly known about the character described. Each character or group is given a few plot hooks to help work them into a campaign. These crossbow bolts, usually for light crossbows, are made of dark wood and dulled metal so as not to be seen. The metal used in them has almost always been reforged from broken or stolen weapons. The Shadowrun campaign continues (with the latest news from 2068 here in Seattle Scream 37). Their were hired to protect someone who was trying to organize the independent talismongers and other magical providers by Jenny Everywhere (who I intend to have cameo next time I run superheroes as well) and managed to prevent a drugged up Triad hitman from gunning the organizer down. A second game had them deliver six mysterious cylinders to the secure areas of a biotech company which they managed to do with one of the characters getting almost gunned down by a security guard while he was gliding away from the building leading to an interesting (and instantly viral) online video of his crash and subsequent rescue by the troll on the team. Next issue (and possibly next game) will see us moving forward into 2069! Tak held his breath as the slave hunters moved by, he was sure that they would see him even concealed among the bags of grain. He thought that hiding in the grain caravan was his best bet but they had tracked him all the same. “Maybe he didn’t go this way,” said one of the hunters. “Sure had to miss the reward on this one,” said the first hunter as their voices receded. Tak breathed a sigh of relief. These necklaces come in a variety of forms but they are always made from the chains that once bound a now freed slave. Some are simple, just a link on a leather thong, others have been transformed into pieces of art. Zoo City by Lauren Beukes, a good read for anyone who likes more than a dash of noir in their urban fantasy. Set more or less in the modern world, with a few changes, specifically the existence of the “animaled” or Zoos whose sins have manifested as a animal tied to them (and bad things happen if that animal is killed) which also unlocks a gift, which is perceived as magic. Zinzi December’s, the main character, gift is locating lost things. Zinzi gets hired to find a person, not her usual gig, but the money is too good to pass up. It is a noir journey along the edges of a South Africa not quite like our own. Dark and intriguing, with some black humor along the way but do not expect a happy ending. For modern/near future gamers, it is an interesting look at South Africa and for Urban Fantasy gamers, it has a neat take on magic in the modern world through the animaled who, as marked by their animals, are also outcasts. If you like you stories dark, give this book a look. “This time, I have something special for you,” smiled Volran Koth, Wizard of the Three Triangle Society to his opponent. “Will it impress me?” sneered Rodan the Blue, of the Many-Colored League. The other wizards, sorcerer and assorted students of the esoteric arts watched from around the dueling circle as the two wizards faced off. Whispering discussions moving among them. The first attack was to Volran as challenger. “Well, it is colorful,” said Volran with a grin. Then, with seven words and a gesture, Rodan was suddenly engulfed in yellow-orange flames. With a gesture and a word of seven twisted syllables, the target is engulfed in pale almost translucent flames. If the target is not a spell caster, the effect end there with the target being dazzled for one round. If the target is a spell caster, the flames feed on their magic, running from the spectrum from pale red (for a low level caster) to deep violet (for an archmage with all spells ready). Read the rest of this entry ? “What a lovely brooch, my lady,” said Assistant Deputy High Judge Vess. “It was a gift from my late husband,” she replied coyly, fluttering bother her fan and eyelashes at the functionary. The peacock jewels flashing. 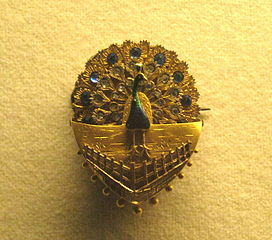 These ornate broaches are always of the finest materials set with gemstones in such a way to mimic the patters of a peacock’s tail. You are currently browsing the Sea of Stars RPG Design Journal blog archives for November, 2012.